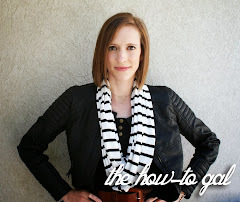 The How-To Gal: Awards Galore! Me being fairly new to the blogging world, I feel very honored, flabbergasted and pleased to have received two awards from my fellow bloggers in the past few weeks. I need to pass them on! The first is the Friendship Blogging Award from Cher at Love, Actually! Thank you, thank you, thank you! About the Award: "These blogs are exceedingly charming. These kind bloggers aim to find and be friends. They are not interested in self-aggrandizement. 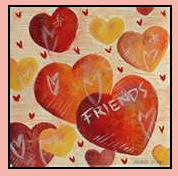 Our hope is that when the ribbon of these prizes are cut, even more friendships are propagated. Please give more attention to these writers. Deliver this award to eight bloggers who must choose eight more and include this cleverly-written text into the body of their award." 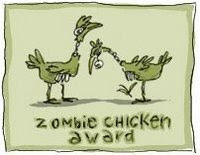 The second is the Zombie Chicken Award award from Jennie at Kiducate. Thank You, thank you, thank you! About the Award: "The blogger who receives this award believes in the Tao of the zombie chicken - excellence, grace and persistence in all situations, even in the midst of a zombie apocalypse. These amazing blogger's regularly produce content so remarkable that their readers would brave a raving pack of zombie chickens just to be able to read their inspiring words. As a recipient of this world-renowned award, you now have the task of passing it on to at least 5 other worthy blogger's. Do not risk the wrath of the zombie chickens by choosing unwisely or not choosing at all…"
Thanks so much! What a crazy fun name for an award...I'm lovin it! your ideas are so fun...i really gotta get going and making something! Thanks again! this is the happiest moment of my life! I now have the award I've never know i've always wanted. You have made my blogging world complete.